The ‘Land Tenure and Development’ Technical Committee is a working group composed of French Cooperation experts, researchers and decision-makers. Since its creation in 1996 it has worked in conjunction with numerous French and international actors to support the French Cooperation in developing strategies and supervising actions on land issues. 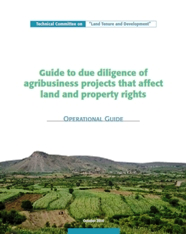 In addition to the White Paper by French Cooperation actors (2009), it has produced an analysis of large-scale land appropriations (2010) and many other works and tools intended to improve our understanding and efforts to address the challenges associated with land issues in developing countries. Full versions of all these outputs can be found on the ‘Land Tenure and Development’ portal (www.foncier-developpement.fr), which the Committee set up to provide access to accurate and up-to-date information on the sector. The recent surge in large-scale land acquisitions has prompted the international community to launch several initiatives to deal with this phenomenon. So far, the greatest progress has been made in 2012 with the endorsement by the Committee on World Food Security (CFS) of the Voluntary Guidelines on the Responsible Governance of Land, Fisheries and Forests in the Context of National Food Security. The Principles for Responsible Investment in Agriculture and Food Systems, recently adopted, improve the voluntary guidelines and raise the issue at stake for the French Cooperation. The objective is to ensure that these principles are practicable and respected in all activities supported by French institutions. This publication draws on the work undertaken by members of the ‘Land Tenure and Development’ Technical Committee set up by AFD and MAE. The Gret - IIED - AGTER consortium was appointed by the ‘Land Tenure and Development’ Technical Committee to lead the reﬂection for this component on transparency and contract negotiation, and to produce this document. It presents an Analytical Framework and a Guide that each institution can now appropriate and use to change their internal project evaluation procedures. The holistic approach used to develop these tools looks beyond the land tenure aspects of projects. It also considers their social, economic and environmental dimensions, allowing potential donors to focus on matters that are sometimes overlooked, examine the economic considerations, analyse how the added value generated by a project is distributed between actors and fully factor in social and environmental considerations. This contextualised analysis takes account of the overall land governance framework and dynamics of change in agrarian systems, using a historical approach to better understand the current situation. As such, it represents an important step to promote evolution in the standards currently used by international cooperation agencies. These tools also use a dynamic approach that places particular emphasis on contractual arrangements for investment projects and on the processes through which those arrangements are developed. In this context, transparency is framed not simply as a matter of publishing contracts, but as something to be taken into account throughout the whole process – from publishing environmental and social impact assessments to consulting local populations and conducting and concluding the final negotiations. The challenge for the French Cooperation was being able to translate very general texts into practical tools. This work is now being taken forward within the AFD Group, and feeding into reflection by other technical and financial partners and groups of actors involved in negotiating or monitoring agribusiness projects that affect land holdings. In doing so, the French Cooperation is helping promote and facilitate more transparent governance of land tenure. The document can be downloaded from the Land Committee Website on this page. Just click on the link below to get it.